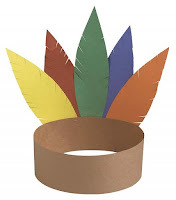 school plays wearing feather headdresses made out of red, orange, and brown construction paper and/or pilgrim hats and the solemn black clothing of the somber Puritans. A table is spread with turkey, pumpkins, and corn. One of my first memories of the Thanksgiving season is a snowy day in Indiana when I was in the second grade in a school play. I was an Indian sitting cross-legged at the entrance of my teepee, but alas! The poorly constructed stage prop collapsed on my head during the play. I simply sat still trying to remain dignified until the teacher rescued me amidst giggles and snickers of the parental audience. 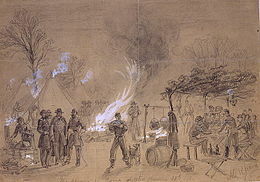 However, although a celebration of thanksgiving to the Creator occurred periodically throughout our history from the very beginning, President Lincoln was the one who in the middle of one of the worst periods in our history, the War Between the States, officially appointed a day for the nation to pause and thank him for the great abundance of this nation. I was stunned to read the expressions of gratitude President Lincoln poured out to God in that formal document. From that time forward Americans have observed a formal holiday on the fourth Thursday of November. During the Civil War shipments of ham, peaches, turkey, oysters, and minced pies from benevolent societies made their way to the Union troops. In the South the fare was more meager. They ate mule meat, a mixture of rice and molasses, and cornbread. 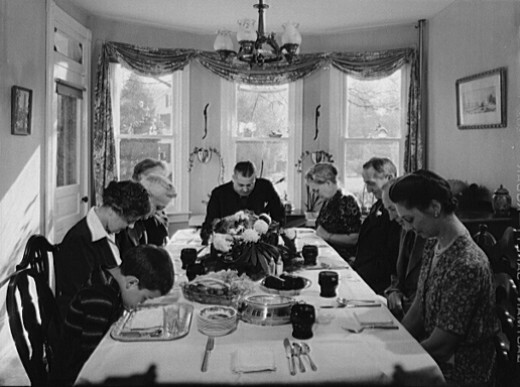 In World War 1 stateside, families were rationed as to what was available for the traditional Thanksgiving meal. Newspaper articles offered ideas for substituting chicken for turkey, leaving oysters out of the stuffing (that would have been fine with me! ), and eliminating the cranberry dishes as they used too much sugar. 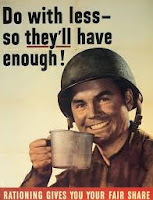 Rationing was supposed to make more available for the soldiers overseas in countries where the crops had been ravaged. The rationing was again a problem during World War 2 both at home and among the soldiers. In addition to food rationing, gas and rubber rationing made it difficult to travel to relatives homes for the traditional family holiday. Men and women were missing from the table. But the traditional holiday continued, although there was some political wrangling as to whether the holiday would be celebrated on the fourth or last Thursday of the month. Recipes abounded helping housewives to make the adjustment of less sugar, butter, cheese, cream, and meat. Still the families managed to gather, in an attitude of thanksgiving to God. I hope as we gather this Thanksgiving season around our table of abundance we we will remember with gratitude all we have to be thankful for in this nation. Our freedom is not free. It has been bought with the blood of our men and women in the military. My brother was killed in Vietnam, so we have had an empty place at the table for over forty years. Parents have passed away, and our children have grown into adults with families of their own. We are not currently engaged in a war, but many of our military are serving overseas during the holidays. Let's remember them and their families. We are indeed a blessed nation. This web page is so fabulous, not only is the heading fantastic but he story it tells. Thank you for sharing it with us. You are truly blessed, and in turn we are blessed also. Thank you.